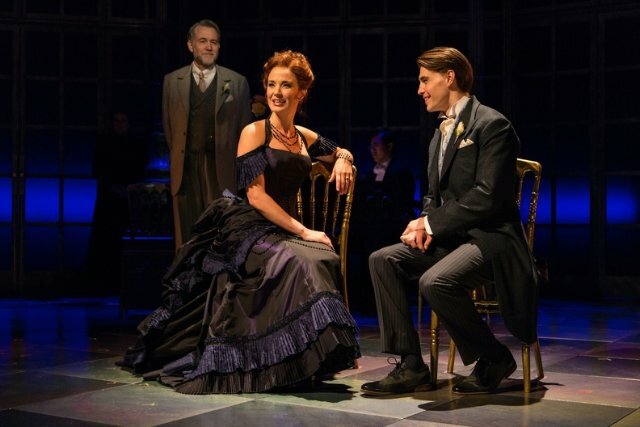 Edith Wharton's Age of Innocence on stage. Do you realize how many professional theatrical productions are seen in Connecticut each year? What would be your guess? With the ending of the Connecticut theater season which runs from about June 1 to May 31, I attempted to count up the shows. I know I missed some. But including all the professional theaters (those that have some type of contract from Equity the actors’ union) plus the productions seen at the major “presenting” houses such as the Shubert, Bushnell and Palace in Waterbury – the total astounded me. In all, you could see a professional production for 100+ nights a year. And that didn’t include the “workshop” performances at Goodspeed-Chester, the O’Neill Center and other places. If you want to consider just the regional theaters – it numbers 70+ productions. (By the way, I saw about 75 percent of these, plus some others). So I was sitting in a theater in Connecticut at least 60+ evenings. My favorites? Everyone’s list will be different. Mine includes plays that were thought-provoking or challenging. But my list also includes plays that were just pure fun. I’ve broken them down in to a list of my “best” plays and “musicals”. These aren’t in any particular order. Some are by playwrights that I am very familiar with and others by playwrights new to me. Hartford Stage gave us three productions that I thoroughly enjoyed and would gladly see again. A Lesson from Aloes by Athol Fugard is a play that I saw first at Yale and found it brilliant. This production directed by Darko Tresnjak was equally so – thought-provoking, beautifully designed and marvelously acted. For sheer fun, nothing could be better than Tresnjak’s direction of A Midsummer Night’s Dream which opened the season. The direction by the Mechanicals was the best I’ve ever seen. And in the middle was the McCarter Theatre’s production of Murder on the Orient Express. Stylish and delightful. Another production I would gladly see again was Grounded at Westport Country Playhouse last July. This one woman show is about a military pilot who is reassigned to operating drones over Iraq from the US. And Playhouse on Park gave Connecticut theater goers a magnificent production of The Diary of Anne Frank. Some plays were very good, but for one reason or another had something missing. Fireflies at Long Wharf was a charming, sweet play that is blessed with an outstanding cast. I’m not convinced that it would as enjoyable in the ends of lesser actors. Jane Alexander, Judith Ivey and Dennis Ardnt made this work. I also thoroughly enjoyed Seder at Hartford Stage, though some of my critic friends hated it. The questions it raised were fascinating and Mia Dillon was fabulous. Also in this group would be The Game’s Afoot at Ivoryton which was silly, light but just fun, Noises Off at the Summer Series at Connecticut Repertory Theatre, The Chosen at Long Wharf, Father Comes Home from the Wars, Parts 1, 2 and 3 at Yale Rep and Age of Innocence at Hartford Stage. Boyd Gaines was magnificent. Some productions miss the mark – it may be a great idea that isn’t quite developed completely, or it wanders off topic, or the director or actors make some erroneous decisions. Or the play may not be that good, but one or two performances make it enjoyable. Luckily most of the time, even if that happens there are elements that still make the production worth seeing. But sometimes, to me the production seems so misguided in so many ways, that it disappoints me. This season there were a few that fit that description. Often my fellow critics disagree with me. Yale’s production of Enemy of the People was just such a production. I felt that both the director (James Bundy) and the leading actor (Reg Rogers) were totally off the mark. Office Hours at Long Wharf was a play that I felt didn’t really work on many levels. I didn’t think there were really any outstanding musical productions this season. By that I mean productions where the work itself and all elements of the production hit the mark. Most had flaws of some kind. Many productions were very good. Ivoryton Playhouse has shown it is capable of presenting very good productions. This season I thought Saturday Night Fever, West Side Story and The Fantasticks were all very good. MTC (Music Theater of Connecticut) has shown that a very small theater (under 120 seats) and an awkward playing area can be made to work for mid-sized musicals. Kevin Connor did a great job directing both The Bridges of Madison County and Fun Home. The Summer Series at Connecticut Rep did a very good Newsies. Goodspeed is held to a very high standard – it has wowed us so many times, that we expect perfection in each production. This year, it may have not have been perfection, but it was very, very good. Rags was a major project: Taking a musical that had failed and working together with the composer and lyricist and a new book writer, to completely reshape the show. Characters were deleted, others added, major plot points changed, new songs written and lyrics revised for other songs. Working with the team was director Rob Ruggiero. This story of turn of the 20th century Jewish immigrants on the lower east side of Manhattan, still isn’t perfect, but the show was done very well and was much improved. Goodspeed also presented the classic Oklahoma! Again a very good production that I felt missed the mark in some ways. Two major theatrical stories hit even the national press. The first was the firing of Long Wharf Artistic Director Gordon Edelstein after allegations of sexual harassment and misconduct. Later this spring, Darko Tresnjak announced he will leave Hartford Stage at the conclusion of the 2018-19 season. This wasn’t a total surprise. While at Hartford, he had not only produced excellent theater but won a Tony award, directed two new Broadway musicals and was increasingly in demand. Just as one theater season ends, another begins. I’m already marking my calendar for the shows that I’m most anticipating.